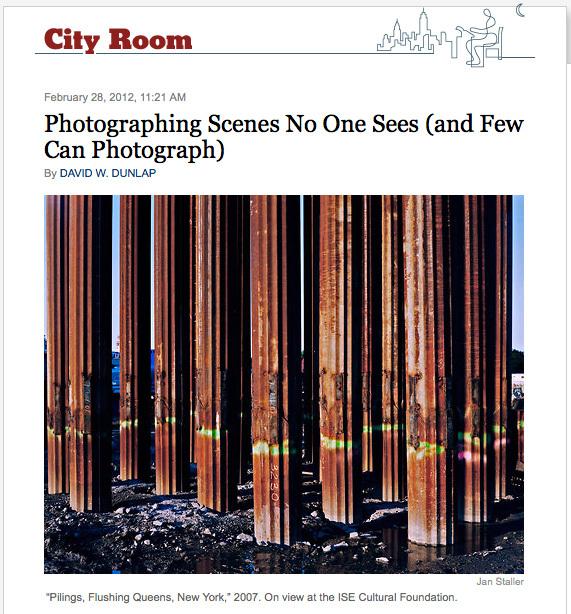 This entry was posted in Exhibitions, Publications on March 8, 2012 by Jan. 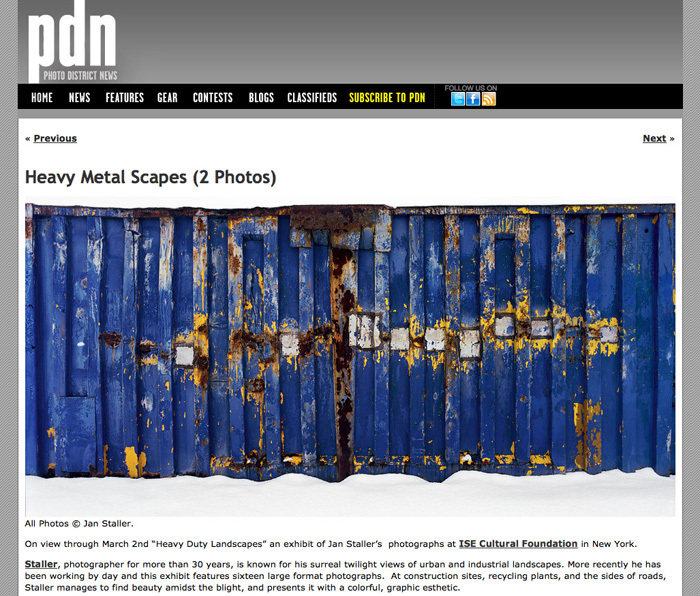 This entry was posted in Exhibitions, Publications on March 1, 2012 by Jan.
ISE Foundation is pleased to announce “Heavy Duty Landscapes” an exhibit of Jan Staller’s photographs opening on January 12th 2012, at 555 Broadway, New York. Decidedly not documentary photography, Staller captures a poetic visual order in the chaos of industrial sites. At construction sites, recycling plants, and the sides of roads – the kinds of places that go unnoticed by most people, Staller finds unintentional, serendipitous beauty. In “Pilings, Flushing Queens,” the oxidized pilings seem to be a carefully thought out earthwork or a post-industrial petrified forest. Close viewing is rewarded by accents of color peeking through the narrow vertical spaces between the pilings. In contrast to Staller’s earlier pioneering twilight and mixed light landscape photographs with their lurid skies, evocative color, and deep space, many of his recent pictures use a flat, white, daytime sky to isolate subjects in tightly framed shallow spaces. In “Tank Car In Snow, Port Reading New Jersey” the pure black form of the tank car is placed centrally within the enveloping white of a snowstorm, according the car an iconic stature. Snow is used to strange effect in two other panoramic works. In a frontally formal composition, a plywood wall barricade appears to be a torn photograph resting on white paper. On closer examination it becomes apparent the torn edge consists of an uneven snowdrift. In another image, a battered blue cargo container is framed with drifting snow at top and bottom, the floating blue panel appearing as if it’s an archeological frieze. In addition to investigating ambiguous spatial qualities, Staller’s images play with sculptural concerns such as weight and gravity. 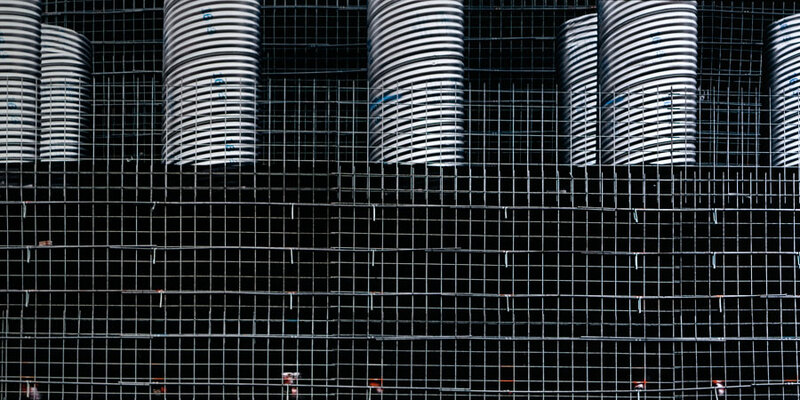 In one construction site photograph, “Grid and Culvert Tubes,” a study in black and silver, the wire grid overlaid on black fabric appears to be both foreground and background, magically supporting the massive galvanized steel spiral columns that comprise the upper half of the composition. In the monochromatic “Target Floor, Missouri,” the repeated patterns of tire tracks covering a concrete floor bring to mind the shadings of a delicate charcoal drawing or the markings left behind by a strange yet-to-be-discovered sea monster that scuttled across the ocean floor. The work in the show is balanced between monochromatic and vividly hued work. Extracted by photography from the real world, many of the objects seem to glow with color, at times confounding our notions about how to read a photograph. In “Rebar Cylinders” brightly colored dots looking like so many dabs of paint applied to the surface of the photograph, are in actuality the painted ends of rusted steel rods. Rather than just showing us things as they appear, Staller presents his singular vision of aesthetic order and unexpected form that he finds in metamorphic landscapes. This entry was posted in Exhibitions on December 12, 2011 by Jan.
Rachael Hodson on Wolfgang Tillmans ≹ Instagram?